In this blog and other blogs that will follow, I will show you how laws of nature limit human expectations borne from ignorance and arrogance. First, I would like to remind those readers who might be scientifically-challenged that the laws of physics, chemistry, and biology are called "laws," because we, scientists, have found no exceptions to them in as many experiments as have been carried out for as long as these laws have been on the books. I repeat: As opposed to legal laws, the laws of nature do not allow exceptions, do not listen to lobbyists, shrug off presidents, and dispatch ignorant scientists to the trash bin of history. Probably the most fundamental law of nature is mass conservation: Mass of anything cannot be created from nothing and mass cannot disappear into nothing. This law was co-discovered by the Russian chemist Mikhail Lomonosov in 1765, and the French chemist Antoine Lavoisier in 1774. Lavoisier described this law in the first modern handbook of chemistry he published in 1789. 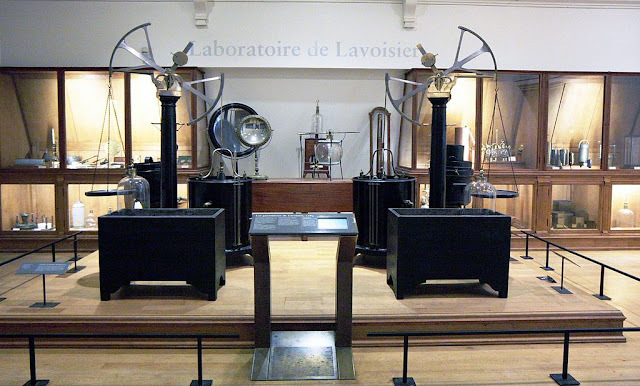 In 1774, Lavoisier showed that, although matter can change its state in a chemical reaction, the total mass of matter is the same at the end as at the beginning of every chemical change. Thus, for instance, if a piece of wood is burned to ashes, the total mass of ash, carbon in the carbon dioxide and hydrogen in the water from the wood burning is the same as the original mass of the wood piece. Since no chemical element, even hydrogen, can leave the living planet Earth, all Earth's households, called "ecosystems," conserve mass on average. Otherwise, these ecosystems would perish with no exceptions. "The living planet," in which life put oxygen into the primordial Earth's atmosphere and created ozone that converts the light hydrogen molecules trying to escape the Earth's gravitational pull into the much heavier water molecules. "On average," because the small and young ecosystems can be subsidized for a while with the mass of nutrients and water from their surroundings. Actually, the law of mass conservation stated above works only because the Earth is also open to the flow of heat. Infrared radiation must leave the planet for life to exist. It is the combination of these two aspects of the planet Earth (she is closed to mass flow and open to infrared radiation) that makes ecosystems recycle all mass on average and export only low quality heat. Soon, I will tell you more about these finely-tuned physico-chemical constraints that maintain life on the Earth. Nature knows of no waste and each large ecosystem recycles all mass. "Waste" is a concept developed by humans to hide our tragic negligence and ineptitude. One species' waste is food for another species, so that in the end no harmful chemicals are left to damage a functioning ecosystem. Nature does not do toxic waste super-sites; only humans do. A small imperfection in nature's total recycling enterprise are swamps, lakes, and estuaries that can bury minuscule quantities of organic detritus and remove it from an ecosystem. Over hundreds of millions of years, this imperfection gave us deposits of coal, crude oil and natural gas. If all mass is recycled, the biomass plants produce must be consumed by these plants and by the non-photosynthesizing organisms (heterotrophic bacteria, fungi and animals, including Homo Sapiens). Nothing spare is left on average at the planetary scale after the Earth completes each orbit around the Sun. Humans disturb natural ecosystems with the greedy monocultures of morphed plants, most of which cannot survive in the wild. We call these monocultures "industrial agriculture." We subsidize agriculture with external flows of nitrogen, phosphorous, potassium, calcium, sulfur, herbicides, pesticides, fungicides, etc., fossil fuels outright, and often water. These plants sprout from the oft-patented and self-destructing seeds, which take more energy to produce than the heating value of an equal mass of gasoline. We then call these simplified, open, and always stunted ecosystems "sustainable agriculture." We can hide behind the fossil subsidies for a while, but in the long run industrial agriculture systems must fail, Monsanto's claims to the contrary notwithstanding. Since, on the Earth, almost no biomass is left unspoken for at the end of each year, and agriculture is a primitive caricature of natural ecosystems, the more agriculture there is on the Earth, the less biomass she produces. In addition, industrial agriculture swamps the surrounding natural ecosystems with a widespread chemical pollution that wounds or kills these natural ecosystems. By area and environmental impacts, agriculture is the largest human endeavor. Therefore, agricultural pollution and emissions are truly global in scale. 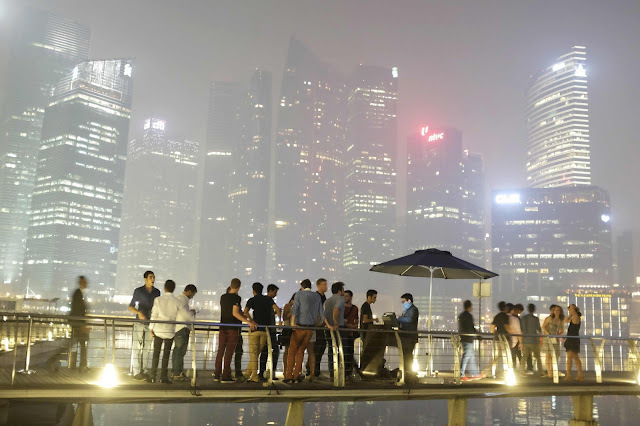 June 22, 2013: This suffocating haze in Singapore is caused by the runaway fires devouring the tropical forest and peat in the neighboring Indonesia. 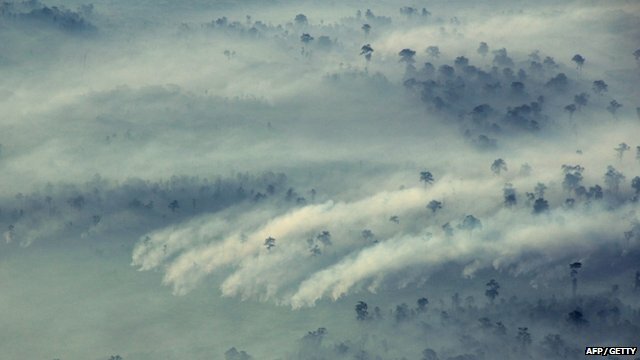 The vast swaths of natural forest in Indonesia have been burned illegally by investors mostly from Singapore and Malaysia to establish the giant plantations of oil palms for biodiesel, food, and cosmetics. Cumulatively over 10 million hectares of the pristine tropical forest have been eliminated in Indonesia. The carbon dioxide emissions from burning forests in Indonesia alone rival all of the emissions from all of the sources on the entire Earth. Of course, agrofuel advocates talk incessantly about the huge reductions of gas emissions from burning biofuels. In the upcoming installments, I will tell you how we measure with great accuracy that all biomass is recycled on the Earth each year. I will also tell you about the monstrous damage to the most important ecosystems on the Earth inflicted by industrial agriculture. Please look at the picture of the haze above, and realize that the lungs of our planet are being amputated in the name of making our breathing easier through the use of biofuels. A haze like this kills infants and elderly outright, and maims other people through allergies, respiratory disease, heart attack, and lung cancer. It also maims all animals. The enormity of the biofuel lie is such that I constantly rub my eyes and pinch myself to check if this is merely a bad dream or modern fascism has arrived. Fascism, of course, is a seamless bundle (from the Latin term fascio) of corporations and state that work together to manipulate and control population. This concept was formulated by Il Duce some 80 years ago. The modern "democracies," using modern technology and slick propaganda have vastly improved on that rather primitive concept. This future oil palm plantation in Indonesia will replace another vast swath of the useless, undeveloped tropical forest. The forest animals will burn or be exterminated, just like countless other species. But the clean biodiesel from the palm oil produced on this plantation will power high-tech cars driven by the enthusiasts of a wonderful new green technology that almost eliminates all carbon dioxide emissions. Congratulations are in order.
" According to Booz Allen's 2011 Annual Report, the corporation has overseen Unified Quest "for more than a decade" to help "military and civilian leaders envision the future." "... converging global trends [which] may change the current security landscape and future operating environment... "
Very interesting. By the way, if anyone is interested, this was all foretold to happen in the Bible! Read the book of Daniel. :o) Remember, ignorance ain't an excuse. Nice piece, thanks, and waiting for the follow up. by Arthur Rimbaud (1872-75); translated by Helen Rootham (1938). THE flag is in keeping with the unclean landscape, and our jargon drowns the sound of the drum. At certain centres we will encourage the most cynical prostitution. We will crush logical rebellion. 'Let us go to dusty and exhausted countries—put ourselves at the service of monstrous industrial or military exploitations. Conscripts of good intentions we shall have a ferocious philosophy. Dunces shall be devotees of knowledge, sybarites enthusiasts for comfort; and for this busy world there shall be dissolution. This is real progress! Forward! March!" I wonder if the fixation on environmental/ energy problems is because of the lack of a military challenger to justify the defense/ intelligence budget. More likely it is a result of our role as a declining power. I was looking through a book my mother had on the history of the Roman Empire and I was fascinated by the written record of military deployments. In the early history of the empire, the legions were stationed almost entirely at the periphery. By the later stages, 40% of the military manpower was in Rome itself. The army protected the empire early in its history, but eventually came to protect the elites from the general population. Those closest to the task of protecting the elites (the praetorian guard) managed to usurp much of the power and wealth for themselves. Maybe history wouldn't repeat itself so much if we did a better job of teaching it. (2) Biofuels serve as a perfect distraction for the well-meaning, but clueless masses of politically active people, who hate oil and natural gas sufficiently to believe in any fairy-tale that involves the words "green," "clean," and "new technology." Regarding declining power, seems to me that the situation is so peculiar (declining industrial civilization for banal reasons more than lack of willpower would perhaps be more appropriate), that any comparison is really tough to make, and the U.S.(or oecd) is still the first military power by far. As to biofuels, which indeed might be the top stupidity around (and a European directive also set targets on them 10% or 15% something like that), maybe a key aspects is that politicians prefer "subsidizing something new" which appear more "moving forward" than taxing what we should be getting "out of" or decreasing consumption. 1) To subsidize something you first need to decide that "it is a good thing"
2) And it is very easy to make mistakes in these decisions, especially around energy. Plus usually it is more about alternative production "solutions" than conservation investment (or scaling down existing solutions). 3) subsidies must come from some budget. - You dont have to define the "solutions" but you favor any of them, be it on conservation or alternative production side.And you leave the job of determining whether they make sense or not to the market.